There once was a little girl named Lorena. For her, looking down was the key to success. At five years old, she rummaged around the floors of Saks Fifth Avenue and Neiman Marcus while her mother browsed through the beautiful racks of clothes. Fallen beads from dresses filled her palms and gave her a small glimpse of the future. “My jewelry is designed for fashion-forward, daring women who are confident and not afraid to show it [by] wearing extravagant pieces.” For those looking for glamour, everything in the Lorena Azizeh collection is exclusive and makes a bold statement. Ethnic prints, patterns and unique colour combinations all inspire a red carpet-worthy collection. Less is definitely not more for this daring designer. “Since I was very young I remember layering on bracelets half way up my arm and rings on nearly every finger,” says the fashionista, who has never gone a day without being perfectly accessorized. She may be a thriving business owner, but the little girl who loved to doll-up in jewelry remains. Going through security at the airport is always fun,” she jokes.Diving into the cultures of her travels, Abuabara says people in Italy have the best eye for fashion. “They manage to wear what in other parts of the world would be considered outrageous yet look impeccable.” Favouring this fearless European mentality, she takes risks and insists “everything can be fashionable as long as you know how to wear it.” Abuabara’s designs never follow the latest trends. 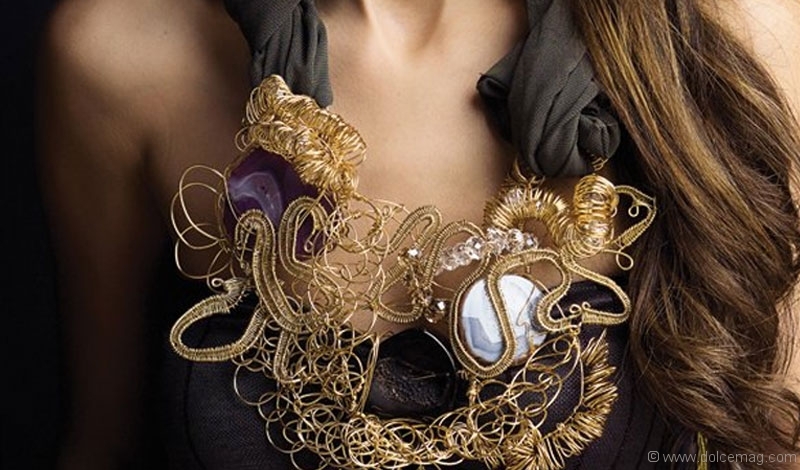 Deviating from the mainstream look is the essence of her jewelry’s appeal.